One of the greatest failures of an inbound marketer comes in the way of content creation. Its not that they can’t create epic and helpful content, it’s quite the opposite. They’re creating too much helpful content. More specifically, they’re focusing too much time on creating helpful content. Neil Patel points out that the promotion of your content is one of the most important steps, but often the most overlooked. You spent time, money, and energy creating a great piece of content, you press publish, send a few tweets, and that is all she wrote. We cross our fingers and hope that the Google likes our optimization and that the tweet shows up in front of the right person. This model is totally wrong. A great inbound marketer is an efficient content creator. An efficient content creator recognizes opportunities to republish, repurpose, and reformat their content for new audiences. After you have published a blog post on your site and shared it with your audience, you have the opportunity to share it on additional blogs. 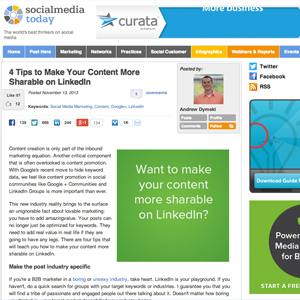 Content Marketing Institute does this by sharing their blog posts on Business to Community. They already have large readership, but they understand that by republishing their blog content they can reach a new set of readers without any additional work. You can also do this through Social Media Today. Once your post is republished, repurpose it as a slide show. Repurposing the content into a slide deck makes it easy to convert into a PDF that can be turned into an eBook. You can place this behind a form and have a new content offer. You can also upload the slide deck to SlideShare, optimize the listing, and begin reaching a different community through social and search. Once you have the blog post repurposed as a slide show, it is time to create a video. This is super simple using a screen capture software like ScreenFlow or Camtasia. Simple record a session where you walk through each slide and explain the content. When you’re done, save the video and upload it to YouTube. Optimize the video with keywords in the title, description, and tags. You have effectively taken one piece of content and turned it into four without coming up with anything new! How cool is that?! Take a few minutes to scroll back through your blog posts to see what opportunities you have to apply the 3Rs. It may not work for every post, but it is a good way to come up with new inbound marketing content ideas.